Saint Peter Canisius, Priest and Doctor – My Catholic Life! Today’s saint made such a deep impact in Germany that the reverberations were still being felt centuries after his death. Saint Peter Canisius composed question-and-answer German language catechisms for every educational level. These catechisms were clear, scriptural, and of the purest doctrine. Hundreds of editions were printed during his own lifetime and for centuries afterwards. Pope Benedict XVI, a German, said that in his father’s generation in the last half of the nineteenth century, a catechism in Germany was still known as “the Canisius.” This was three hundred years after Peter Canisius had died. If Saint Boniface was the Apostle of Germany in the eighth century, then Saint Peter Canisius was the Catechist of Germany in the sixteenth. 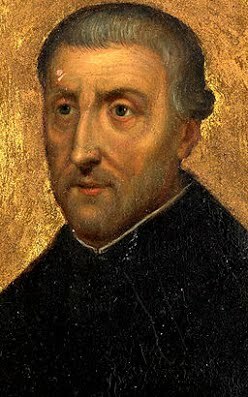 Peter Canisius was born in the Netherlands and attended the University of Cologne. During his studies, he prayed at a Carthusian monastery and came to know one of the very first Jesuits. After a period of intense discernment, he joined the Society of Jesus. He was ordained a priest in 1546 and just one year later participated in a session of the Council of Trent in the employ of a German bishop. Soon after this experience at the highest level of church life, Peter was sent by Saint Ignatius of Loyola to teach at a minor Jesuit college, a test of Peter’s obedience. This ministry was short-lived, as Peter’s erudition and skills were destined to have a wider scope. Peter was a working, teaching, preaching scholar who did all things well. He edited the works of Saint Cyril of Alexandria, Pope Saint Leo the Great, and Saint Jerome. He wrote over eight thousand pages of letters to people in every rank of society. His refinements of his popular catechisms never ceased, and he worked for years in tandem with other scholars to compose a work on church history to counter a popular Protestant history book which twisted the truth of Catholicism’s role in European history. Peter’s life was spent crisscrossing central Europe in an era fraught with religious tension. The concussive force of the Protestant Reformation stunned the cerebellum of Central Europe for decades. Shock, confusion, and violence spread outward from Germany in wave after confusing wave. Peter and many others slowly helped Germany, Switzerland, Austria, and Bohemia to recover their mental health and to remain true to their historic Catholic identity. Peter was in Vienna, where the people and princes wanted him to stay and be their bishop. But Saint Ignatius, his superior, said no, Peter’s skills were needed elsewhere. Then Peter was in Prague, starting Jesuit colleges, preaching to empty churches and, in the end, winning the day. Then Peter was in Bavaria, then Switzerland, and then Poland. His zeal, learning, and holiness were self-evident. He held blameless the majority of Protestants, who were such out of ignorance or apathy. He reserved his rare invective only for the heresiarchs themselves, and other intellectuals who should have known better. He distinguished between those who were willful apostates and those who were the victims of circumstances. Peter Canisius was a perpetual storm who rained down knowledge, apologetics, books, sermons, and letters over all of Central Europe. He brought calm and moderation to a violent, fevered time. One biographer estimates Peter traveled twenty thousand miles on foot and horseback over a period of thirty years. Peter Canisius was canonized and declared a Doctor of the Church on the same day in 1925. Saint Peter, God raised you up at the right time to save the faith in Central Europe. Your even temper, broad knowledge, life of prayer, and personal virtue brought lost sheep back into the fold. From heaven, help all priests, deacons, and teachers to do the same.